Our temple is called Sarvajana Mandir. The mission of the temple is to provide a place of worship for the followers of Hinduism in the Huntsville area, to provide a forum for scholarly discussions of the Hindu philosophy and to facilitate Hindu worship in various forms such as Poojas, Bhajans, Prayers, Satsung and related religious activities for all Hindu denominations. It strives to have spiritual and cultural upliftment for all relating to Sanatana Dharma and allied Hindu beliefs, while affirming the concept of global family. The Hindu Cultural Center of North Alabama (HCCNA) is a registered non-profit organization founded in 1995. Its mission is to promote spiritual and cultural upliftment for all relating to Sanatana Dharma and allied Hindu beliefs, while affirming the concept of global family. 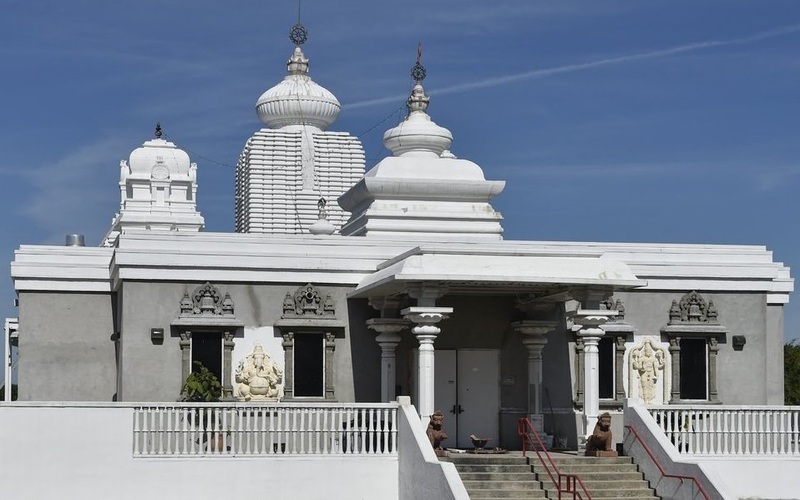 The current HCCNA Temple was consecrated in June 2005 and the deities were installed with an elaborate week-long Vedic ceremony conducted by priests and spiritually energized by Swami Dayananda Saraswati, Swami Viditatmananda and other religious and community leaders. The deities installed in the first phase are Lord Jagannath, Balabhadra and Subhadra in the center as you enter the temple, Lord Ganesha on the left side and Lord Venkateswara on the right. Other deities were installed on all three sides of the temple in 2006 and later in elaborate Vedic ceremony. The deities were Ganesha, Durga, Karthikeya, Sri Mahalakshmi, Radha Krishna, Sri Saraswati, Ram Parivar, Navagrahas, Shiva Parvati (Lingaraj), Kali, Hanuman, Durga, Lords Mahavir and Parshwanath and Lord Buddha. The HCCNA Temple now has huge space for praying and religious discourses. It also has a community hall, kitchen, dining facility and plenty of parking surrounded by beautiful landscaping. The community hall downstairs can be used as a social hall for religious and non-religious activities. It has a state of the art sound system and a commercial kitchen for social functions. You can also rent the community hall for special family functions. The temple architecture in the Hindu tradition is connected to astronomy and sacred geometry. The temple is a representation of the macrocosm (the universe) and the microcosm (the inner space). The temple consists of inner sanctums in which the idols are housed, with space for its circumambulation, and a congregation hall. The sanctum is crowned by a tower carved by skilled artisans called Shilpi’s. The tower called Shikhara or Vimana is visible from a distance as a symbol of upward human aspiration and as a landmark of the temple.